In early June, a six-alarm fire left dozens of Mass. residents without clothing, food, and shelter. To survive, Lawrence fire victims needed the help of the community. Northeast Rehab’s Lisa Bradford knew she had to do something to help these fire victims. “When I heard about the Lawrence fire and how many people were displaced from their homes, left with only the clothes on their backs, I felt compelled to help them. 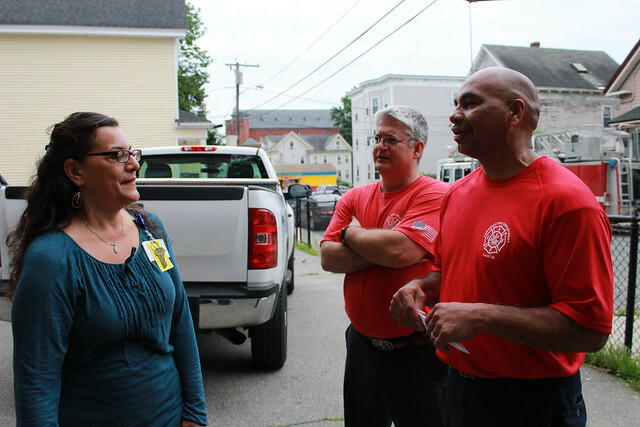 I reached out to the Lawrence Fire Department and was put in touch with Juan Gonzales who is in charge of the ongoing efforts to help the families,” Lisa said. First, victims need a new place to stay: an extended hotel stay, temporary invitation to your home or an apartment. Please send all information to heallawrence@aol.com. Donate $25 gift cards to Market Basket, Wal-Mart, Target, Kohl’s, CVS or Walgreens. These can be dropped off at Mayor Dan Rivera’s office at Lawrence City Hall, marked for Heal Lawrence. There will be a tax-deduction form. Physical donations can be made to the Wish Project in Lowell. They assist our clients when they find permanent housing or return to their homes. Reach the Wish Project at 978-441-9474. Finally, extend their hotel stays: send monetary donations to the ECCF, Essex County Community Fund. Northeast Rehab is proud to go red this February!